Do you know where your milk comes from? Did you ever wonder why some milk tastes rich and others watery? Why does some milk have a wonderfully pleasing taste while others have an off taste? Most milk is co-mingled and trucked in from several different states. 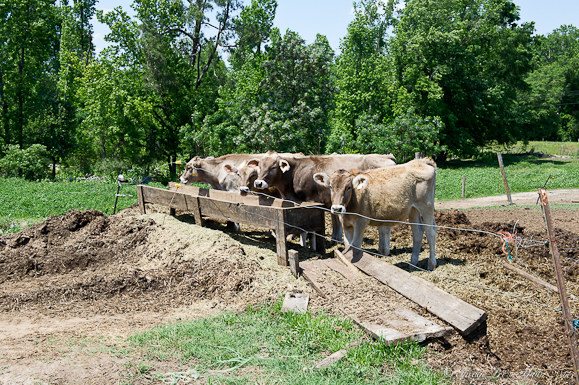 The milk comes from different types of cows with different feeding and processing. We learned this and much more after visiting with Ginny and Jimmy Franks of Southern Swiss Dairy in Waynesboro, Georgia. We first met the Franks family at the Georgia State Fair last year over a container of their chocolate milk. We went to see their beautiful Swiss Dairy cows and they offered us some of their milk which is bottled at their own processing plant at their farm. This was unlike any other chocolate milk we had ever tasted. That rich, cold, velvety chocolate taste that lingered in our mouths…It brought back memories of my childhood and having Bassett’s Ice Cream from the Reading Terminal Market in Philadelphia. That was the richest dairy product I had ever tasted until this milk! The quality of the milk produced by their cows and the higher fat content made this milk something special. Of course, we knew this was going to be an On the Road adventure at first sip. We just had to wait until this Spring to get to their farm! Southern Swiss Dairy is a small family operation in southeast Georgia with 140 milking cows (the majority are Swiss Dairy cows). They have 950 acres of land and grow supporting crops on much of their property including corn, barley, hay, rye grass and oats. 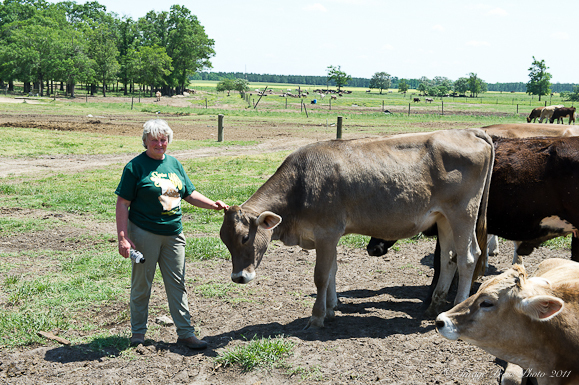 Ginny’s family has always been involved in dairy farming and after living in North Carolina and South Carolina over the years, managing some larger herds over that time, they moved to this property in 1987. Most whole milk that you purchase will be 3.25% fat. The milk fat is 3.5% in the Southern Swiss Dairy whole milk. If you have ever wondered why 2% milk varies so much in taste, it is because 2% milk can range (by law) between 1.1 – 2.5% fat. At Southern Swiss Dairy, their 2% milk has exactly 2% fat. Their milk is not homogenized, so you will find that you need to shake it well before drinking it or using it in cooking to mix the fat into the milk properly. 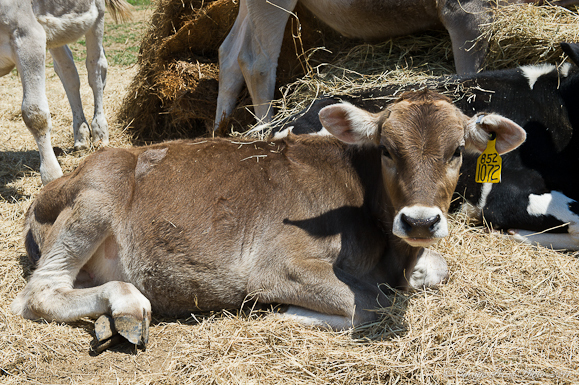 Brown Swiss cattle are known to be the oldest of all dairy breeds. They originated in the northeastern part of Switzerland. They tend to hold up better under heat so they produce more milk in hot climates. Since they are not adversely affected by the warmer climates, they are able to eat more (therefore producing more milk). They also do not seem to have the same breeding problems as some of the other breeds (like the Holsteins). 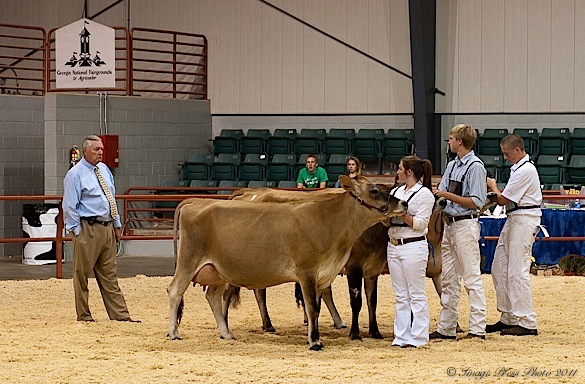 They have good feet and udders and stay in the milking herd for more lactations than other dairy breeds. These cows will grow to an average weight of 1600-1800 pounds and will live to be 10 to 11 years old. They will generally breed or “calve” once a year. The Franks are involved in a dairy coop which is the way most small dairy farmers market and sell their milk. 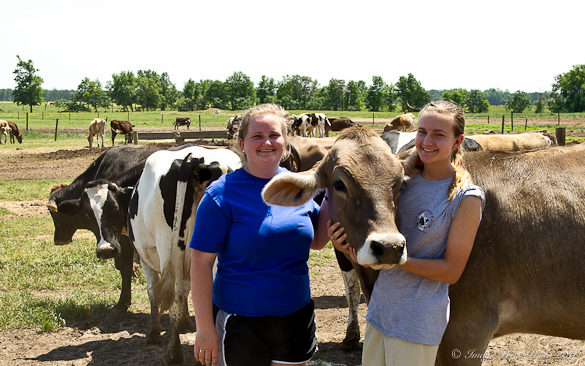 Their cows will produce approximately 900 gallons of milk per day. That means each cow is producing approximately 6 1/2 gallons per day. Their cows are milked twice a day. I’m thinking that’s a whole lotta chocolate milk… and a lot of work! Their coop is regulated by Federal and interstate regulations. The regulations make it very difficult to make a profit from their milk. The milk is co-mingled with other farmers’ milk and they have to truck their milk to Florida to sell it to the coop. Jimmy told me that if the coop falls short on the milk that it needs to cover its customers, the shortfall is then divided amongst the coop members to cover the cost of trucking it in from somewhere else. The Frank family recently decided to bottle and market their own milk and milk products as a way to make a profit on their own branded milk, in addition to working with the coop. 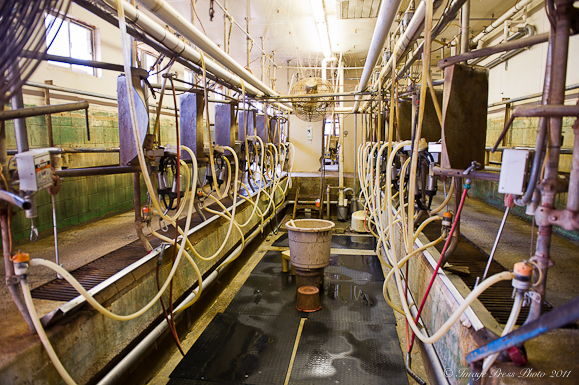 Although they are using their own milk (that has never left their dairy farm and has only traveled several feet to the processing plant) to make and bottle their own dairy products, they still have to sell their milk to the coop first and then buy it back. Jimmy said that much of the time they are paying more for their own milk than what they can sell it for. What a beautiful post! Love the looks of that cake, too! Thank you for your comment. 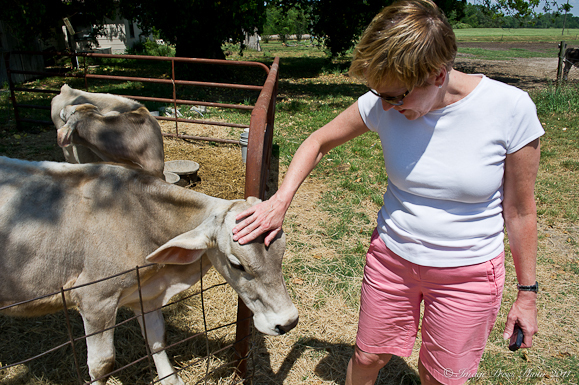 We love visiting these farms and meeting the families that produce our food. The lovely dessert is definitely a benefit from our travels! Look at those adorable cows! You really go to some amazing places. Just lovely! And the cake… I really don’t know what to say. I’m salivating from looking at those pictures. The Bunkycooks’ team truly does an outstanding job on these farm visits – the farmers must be so pleased with the informative write ups, stunning photographs, and wonderful recipes featuring their products. That pudding cake looks so moist and decadent. Another great On the Road post! What a great family farm! I wish the Frank family all the success in the world. 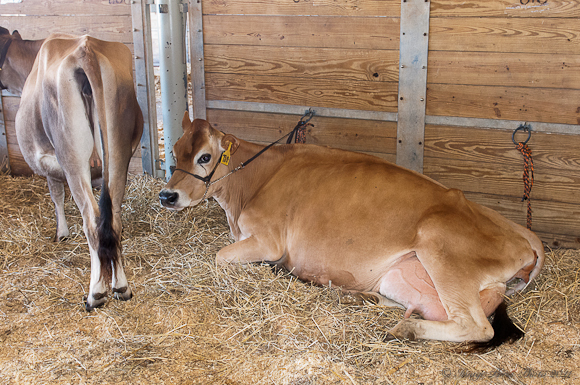 Those Brown Swiss Dairy cows really are the prettiest breed of all the cows, and the calves are just adorable. Your cake looks and sounds so yummy. Definitely perfect for summer! Another great on-the-road post about a wonderful local food source. I’d love to try some of their products next time I get to the Buford Highway Farmers Market! Yum, that cake reminds me of Tres Leches! Sooo delicious! I was just going on a rant about how I just don’t like fat-free milk! I bet I never told you that I used to live in Switzerland! The milk over there is phenomenal, and completely different in taste from ours. The double-creme is like BUTTAH. Seriously! Yellow and thick and heavenly! I had no idea that the butterfat in 2% milk could vary so widely! It’s true, so many of them do taste so different. And my kids are very particular about the taste of the one they prefer: I think it might be a bit richer, because they absolutely despise the one I prefer: Sweet Acidopholus, which I think is only 1%. What an amazing visit. My uncle-in-law was a dairy farmer for many years and he had his milk trucked off so I know it was mingled in with many other farmers’. This looks like it’s worth a special trip though. That pudding cake is also something else. 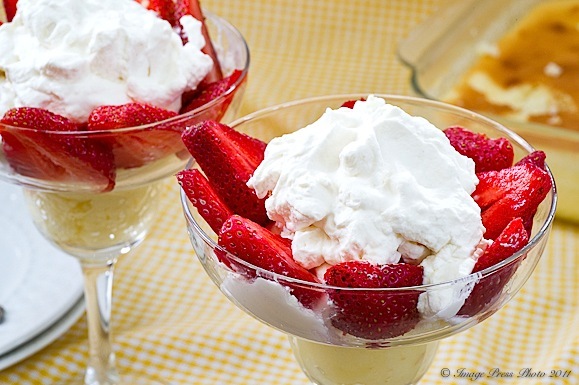 I don’t know that I’d want to cover up any of its flavor with berries and whipped cream. It looks fantastic all on its own. Beautiful photos! There is just something about a dairy that warms my heart and local milk has been a big topic for me lately. They seem to be on the upswing in KY and milk from the area is becoming much more available which I am loving! In the last ten or so years, MANY of the dairy farmers in Southern CA have sold their properties to the home developer throwing the most $$ at them. 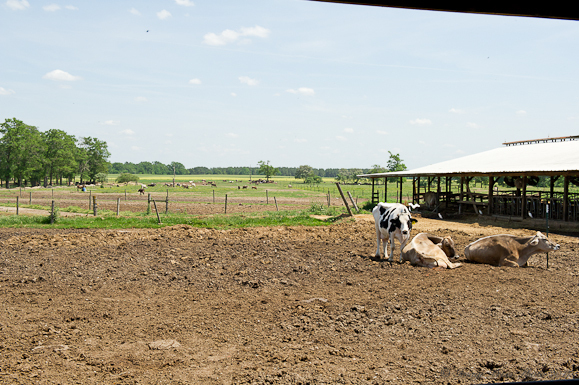 So here, the cows are disappearing, and in their place – 7,200 sq. ft. tract homes. Sad. The cows at Southern Swiss Dairy are beautiful! I’d love to take a pair home and put them in my own backyard. It’s amazing how tastes can vary, based on animal breed, location, and diet.